Performers include: Bear Grylls (host). This adventure reality series is hosted by a world-renowned survivalist, Bear Grylls. The competition tests 10 pairs of contestants as they venture into the unforgiving and dramatic landscape of New Zealand’s South Island. Their mission is threefold: survive the wild, journey as a group, and avoid elimination. From dense forests and sheer mountain drop-offs, to freezing cold rivers and unforgiving glacier crevasses, the landscapes are harsh, remote and physically and emotionally draining. All along the way, Grylls is watching and looking for that survival spirit, resourceful skill, and heart-led determination that he knows the wild demands. At the end of each leg of the journey, there are difficult and emotional decisions to be made by Grylls as he chooses who should leave the expedition. As the stakes get higher, the obstacles become more unyielding. As civilization gets closer, the journeys get harder, until ultimately only one duo remains. The three remaining teams encounter their final challenge — a wet rainforest amidst torrential downpour that pushes each of them to their limits. In the end, Grylls selects father/daughter team Andrew “Lucky” Larson and Andrea “Louie” Larson from Illinois as the winning team. The duos of Chris Winter and Jeff Powell from Texas and Austin and Jim Vach from Washington are the runners up. What do you think? 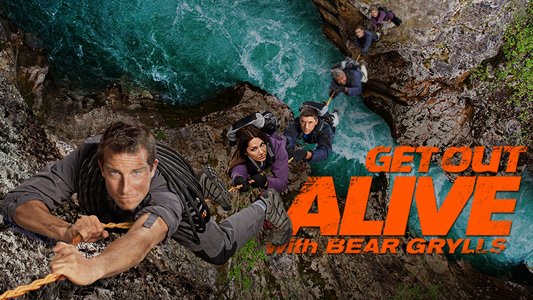 Do you like the Get Out Alive with Bear Grylls TV series? Do you think it should have been cancelled or renewed for a second season?